Is a toy Maltese puppy right for you? 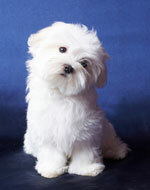 The American Kennel Club weight standard for Maltese is 7 pounds and under with 4 pounds to 6 pounds preferred. Maltese under 4 pounds are at risk for many diseases such as: extremely fragile bones, not enough room for healthy teeth, weak internal organs that often fail, low blood sugar that could lead to a coma, and much more. Most toy Maltese are actually just premature puppies or runts of the litter. Maltese toy dogs are more expensive than conventionally bred Maltese, often commanding a price of over $1000 or more. Educate yourself even more about the Maltese toy dog or teacup Maltese puppies and find out the sad truth about what happens when breeders are irresponsible. Instead of encouraging them to keep producing tiny, sickly, short-lived creatures; stick with a reputable breeder that does not advertise Maltese toy dogs. Learn everything you need to know about Maltese puppies.